If you would like to bring your dog, please state the breed. If there are children in your party please state their ages. This is our privately owned (and treasured) Holiday Home which we are very happy to hire out. 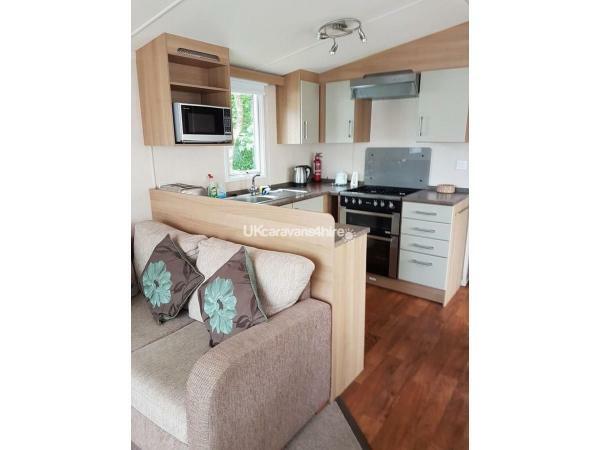 It is a very modern (dog friendly) caravan with lovely interiors (see photo albums on facebook, search - Stonelake Caravan), enjoys a lovely quiet south facing pitch, (plenty of sunshine on the wrap around decking furnished for your enjoyment with table & chairs) on the family friendly Parkdean Resorts, St Minver Holiday Park (Parkdean Resorts having won in 2017 Winner of both the British Travel Awards - "Best UK Family Holiday Parks Operator" and "Best Camping & Mobile Holiday Company"). 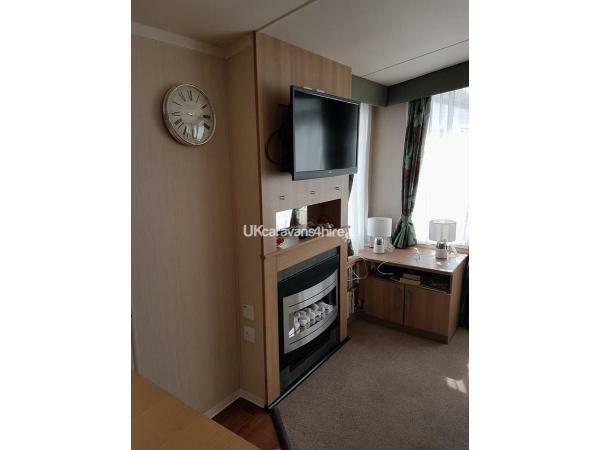 Sleeps 8, Flat screen TV/DVD in comfortable sized lounge. Well equipped kitchen with good sized fridge/freezer. 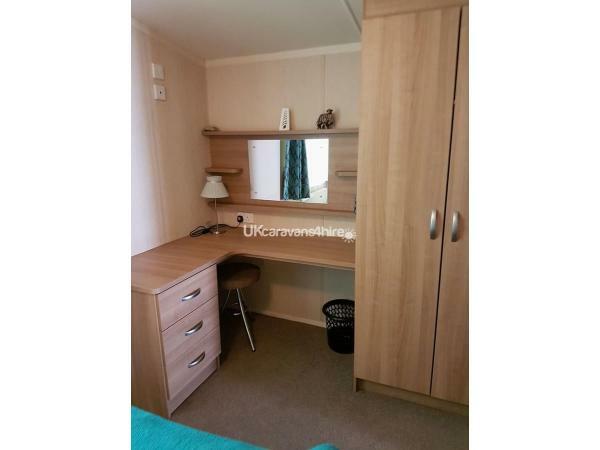 Master bedroom has en-suite toilet with good size dressing table area including a hairdryer with diffuser. Two twin rooms and a double sofa bed in the lounge. Shower room with good pressure shower. 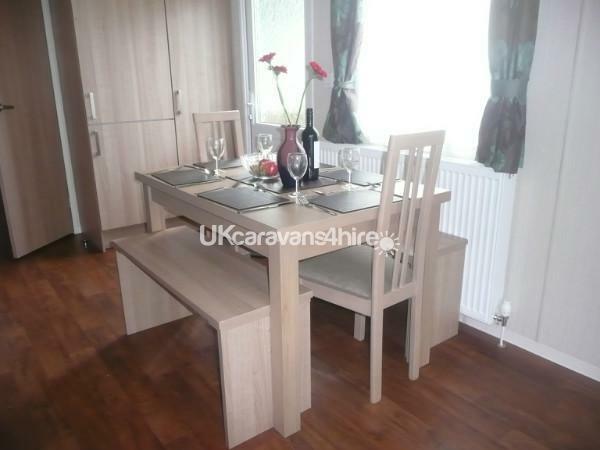 To the side of the caravan is a grassy area with patio and picnic table and a car parking space on gravel. St Minver Holiday Park is nestled between the mature woodland, the park is set within the grounds of an old manor house which now houses the well-priced restaurant, Costa coffee, bar, function room, games room including table tennis, soft play area, amusement arcade, SKY Sports, Internet Access, Evening Entertainment. Free Wi-fi is available at The Manor House. The 30 meter heated indoor pool is lifeguard-maintained - there's even a sauna! Opposite the swimming pool is the shop selling groceries etc.. There's a busy daily children's entertainment programme complete with their own characters Sid and Lizzie. The outside play area is popular with young children! Also a Crazy Golf course. The quaint village of St Minver is just above the Manor House with Church, Post Office and the Fourways Inn offering free wi-fi. St Minver Holiday Park is 2 miles from the exclusive village of Rock. At Rock lies the idyllic ferry trip across the Camel estuary to the quaint fishing town of Padstow, made famous by Rick Stein. Also close by is the surfer beach at Polzeath and the windsurfers' paradise Daymer Bay. We recommend the beach walk between Rock and Daymer Bay - heaven! You could easily spend whole days lazing on the beautiful golden sands (weather permitting, of course). Dogs are allowed on both Daymer Bay and Rock beaches. The walks in this area are just the best in the world in our opinion! We have a dog and we welcome well-behaved dogs into our pet-friendly holiday home. Next to Daymer is St Enodoc church, the final resting place for John Betjeman (famous Poet), within the dunes and picturesque golf course. Ride bikes on the stunning Camel trail from Padstow to Wadebeidge and then on to Bodmin for the more energetic members of the family. Or further afield Cardinham Woods, Near Bodmin with lovely walks, cycle paths, children’play area and a cafe. Port Isaac is a short journey away - made famous by it being the setting for the TV series Doc Martin. Why not visit Wadebridge, a vibrant town with some lovely shops, great restaurants and a cinema. Or visit the award winning Camel Valley Vineyard for some local wine tasting! Another lovely coastline nearby includes Trevose, Treyarnon which is well worth a visit. Not to be missed the walk from Harlyn Bay to Mother Ivey's Bay - love it! Further afield is the Eden Project, a stunning and very educational place to visit. It's a gastronomic paradise with top restaurants including Rick Stein's Seafood Restaurant in Padstow and celebrity chef Nathan Outlaw's Seafood Grill in Port Isaac. We particularly like The Blue Tomato Cafe at Rock overlooking the estuary and very much rate the food and drink – mmm!! Also Rojanos In The Square in Padstow is another favourite of ours along with Rock Inn. Weekend and short breaks available. You just need to ask. Central heating throughout provides a warm and cosy break when it's chillier outside. The caravan is well insulated. Weekly prices vary from £199 to £795, we also offer short breaks. For more information contact us and we will be pleased to advise you. Please see the availability calendar or contact/email us: alpha.steve@hotmail.co.uk, or mobile 07792405485. Travel cots and high chairs can be hired from reception for approximately £10 per item. We can take out single beds if you wish to site your travel cot in the twin room/s - just ask! All rates exclude entertainment passes which can be purchased from reception, in 2019 the park charged £16 per week. Under 3s are free giving you access to all of the entertainment and the indoor pool. The passes can also be used at other Parkdean Holiday Parks during your holiday. A non refundable deposit of £100 secures your booking. The balance of your holiday is payable 28 days prior to the commencement of your holiday.If you need to cancel then please do so at the earliest opportunity so we can make the week available to others. Available from 4pm on the day of arrival, vacate by 10am prompt on day of departure. Bed linen is supplied and beds made up on your arrival, but towels and tea towels are not. 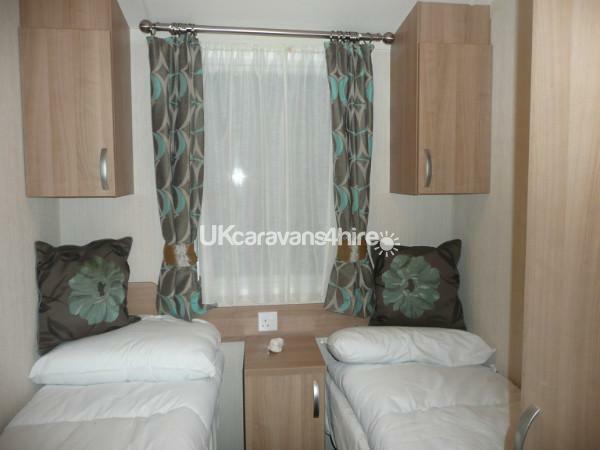 Towels can be hired from reception.. On departure date, please strip the beds and clear all rubbish from the caravan. For more information or to book contact us by either emailing: alpha.steve@hotmail.co.uk, or mobile 07792405485. 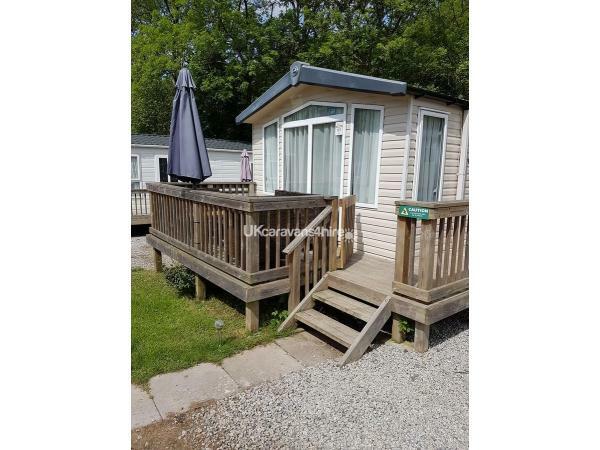 Had a great time in this fantastic well equipped holiday home at St Minver holiday park the caravan is very spacious and well laid out particularly liked how the living space and bedrooms were separated by a hallway makes the noise level down to a minimum especially if you have children. Full kitchen facilities nice to have the two bathrooms. The woodland holiday park itself is lovely. If you want a quiet relaxing holiday you have got it and if you need entertainment it is all on tap too : best of both worlds! St Minver itself is such a pretty village everything you need to if you want to go off site. The beaches are stunning, great for walks, lazing in the sun, barbeques, watersports, sand castles, etc. Must explore this great area of Cornwall as it is fantastic forgot to mention lovely indoor pool on the holiday park : keeps the children happy whatever the weather is doing! 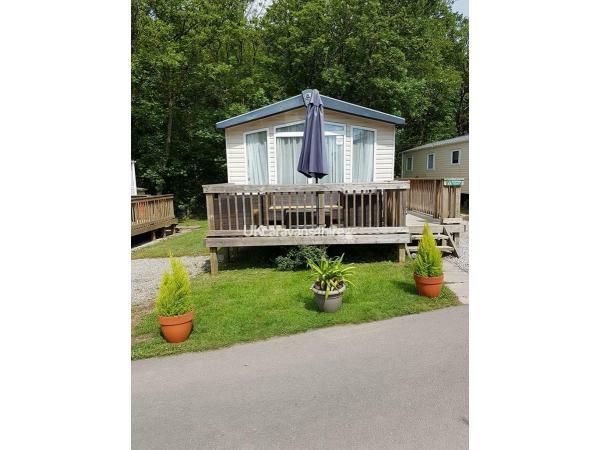 All in all can highly recommend this lovely holiday home on a great holiday park in a fantastic location. Thank you Fiona and Peter McAughey for sharing your holiday home with us. Thank you so much for letting us stay in your lush caravan. We had a great weekend! The kids loved the site so much that we hardly saw them for the whole weekend...until they were hungry!! We also adore the area. We'll definitely go back. For me this has been possibly the best caravan holiday we've been on,My 11 year old daughter emerged from her bedroom last night,cuddled me and said "thanks mum that was the best ever"trust me for that to have come out of her mouth it must have been good! 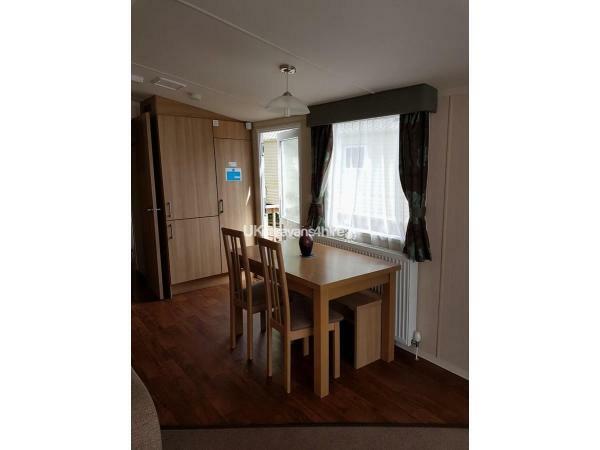 We've done a lot of caravan weekends having young children and this by far was the best,in terms of sight and accommodation it could not be faulted,from friendly communication to an immaculate,clean well presented and furnished caravan,the personal touches of hospitality were well received! Being able to take our pup was another plus.The sight itself was immaculate and the staff all friendly,the swimming pool was another hit! The surrounding area is an amazing sight with so much to see and do for all ages,with the most beautiful coastline. I would recommend Peter and Fiona for a great,personal and friendly holiday. Thank you again and looking forward to our return in August! 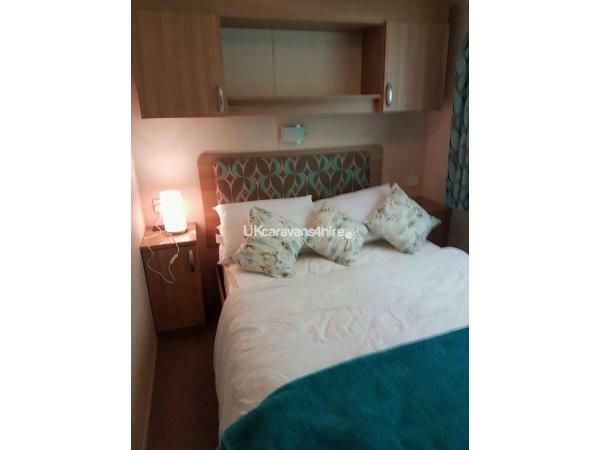 Additional Info: Entertainment for all ages, indoor swimming pool, shop, restaurant, bar, amusement arcade, reception,launderette, outside play areas set on a lovely woodland park, nice walks around park.